What Will I Find in the Book List? Fiction based picture books are connected to the Next Generation Science Standards (NGSS) and to the Common Core State Standards (CCSS). How the Book Lists are Organized? The Book Lists are organized by grade level. Each grade level link connects to a book list spreadsheet. 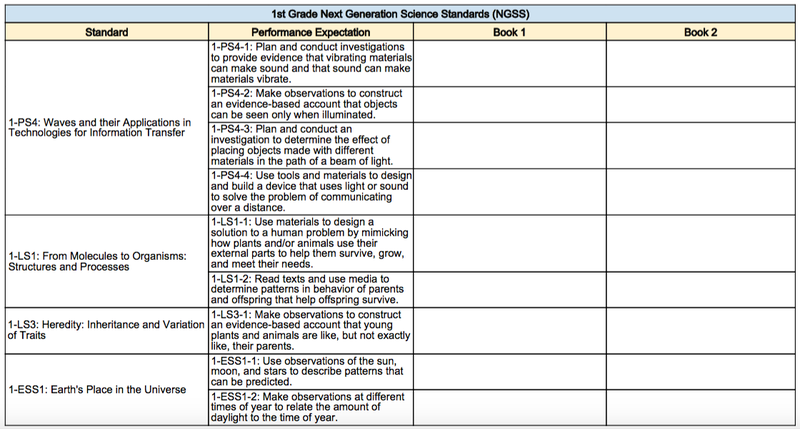 The spreadsheet is organized by NGSS standard, delineated performance standards, book titles, and potential Common Core State Standards (CCSS) connections. See the pictures below for an example of each type of sheet that you will find per grade level. Can I Request a Book be Added to the Book List? Absolutely! I welcome recommendations for new additions. Each book list spreadsheet is a work in progress and I encourage suggestions. If you find a fictional picture book that would be a great addition, please submit your book suggestion here.